During the 9th inning he was hit on the hand by a pitch. Pins and surgery followed. It’s been eight weeks since Derrick’s been on the field…but he’s back. 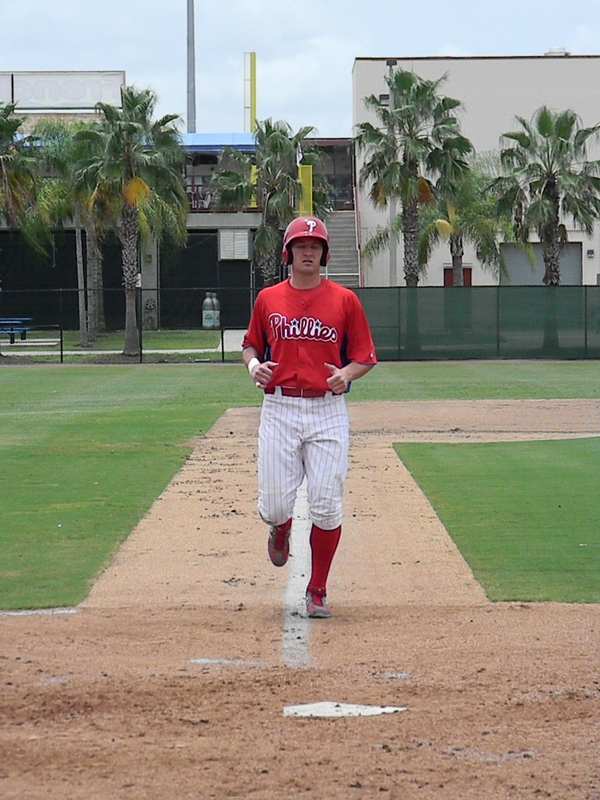 He played yesterday with the Gulf Coast League Phillies in a game in Orlando against the GCL Braves. He hit a home run and had a put out as he played centerfield. Derrick Mitchell hits a double, the ball was just a foot or so away from being a home run. 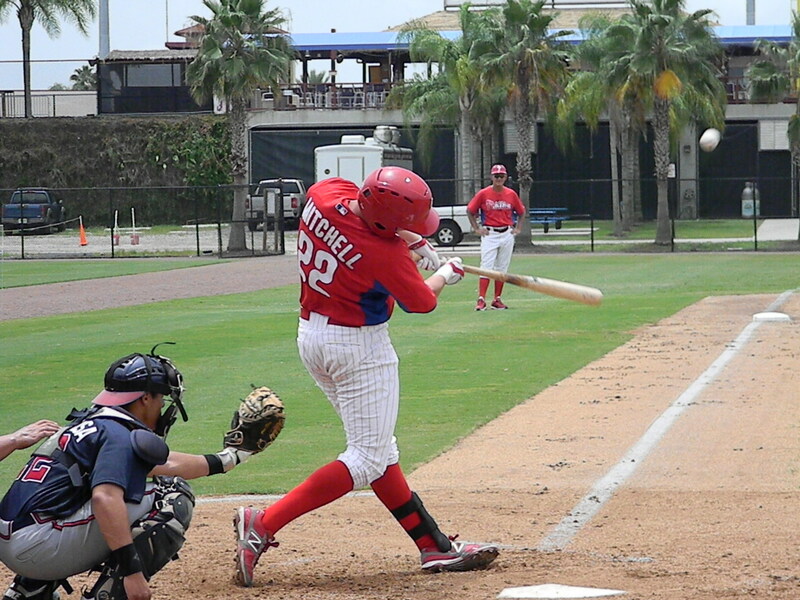 It’s good to see him back on the diamond and hopefully back in Lehigh Valley soon. Baseball Ross and I are moving to Dunedin, a town right next to Clearwater. Ironically we’ll be the same distance from Brighthouse Field where the Threshers play, but we’ll be coming from the North, instead of the South. I mention this because Dunedin has it’s own Florida State League team, the Dunedin Blue Jays. They are affiliated with the Toronto Blue Jays. Their stadium is only a few blocks from our new house and we are trying to get to know the team as they are so close to the house. Dunedin is much different from Brighthouse. Unfortunately, they usually only draw about 100-200 fans per game, much different from the 800-1000 or so that attend most Threshers game. Ross and I usually get a laugh as they now have a Booster Club section, but we have never seen more than six people sitting there. Dunedin, however, has lower ticket prices than Clearwater. For SIX BUCKS, you get to sit anywhere in the stadium, if you like sitting behind the plate, it’s a savings of 3.50 per ticket, per game. 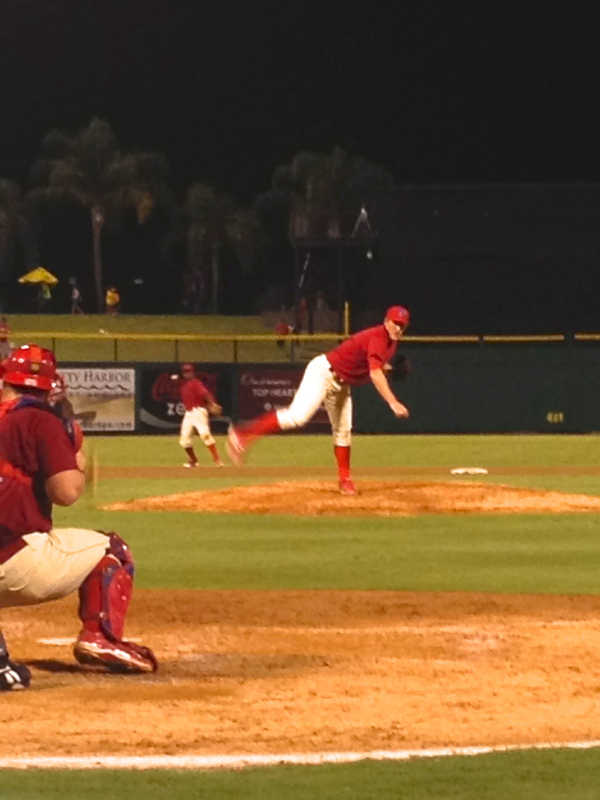 Dunedin doesn’t have the on field, between innings entertainment like Clearwater does. They have some, but not as involved and not as frequent. What they DO have is iPad Friday. The first Friday of each month this season, they’ve given away a brand new iPad during the 8th inning. With the attendance at the games, (you must have purchased a ticket, people with comp tickets are not eligible) a 1 in 200 or so chance at an iPad isn’t too shabby. The most fun thing was…what you might call the “Dash for the Diamonds”. 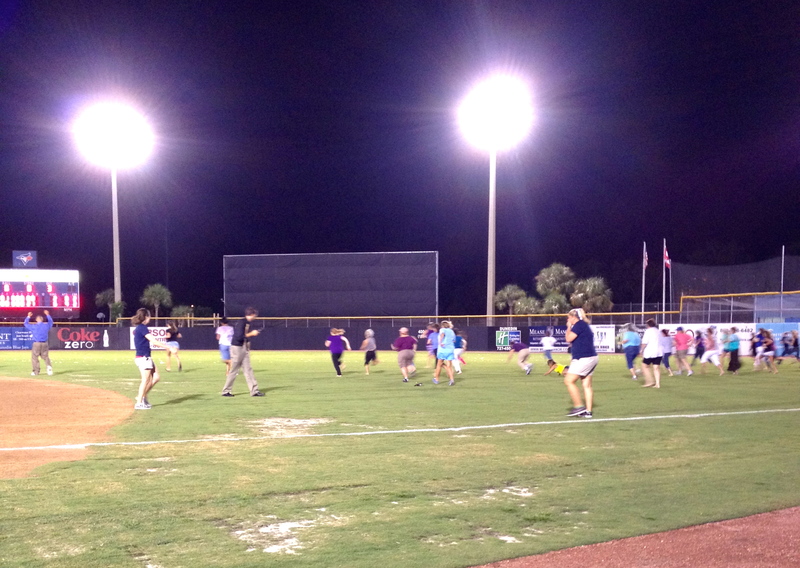 After the game, ladies who had signed a waiver (guess they were expecting us to kill each other) would take the field. They covered the entire outfield with 500 jewelry boxes. There were 18 smaller prizes and one box contained a diamond ring! If you have seen the movie, “The Hunger Games”, this was just like the “launch” scene at the beginning of the Games, where Katness Everdeen and her competitors run toward the cornucopia to grab supplies and weapons. It really felt like that except instead of being 15 and fighting our lives, most of us were middle aged and praying not to blow out a knee. 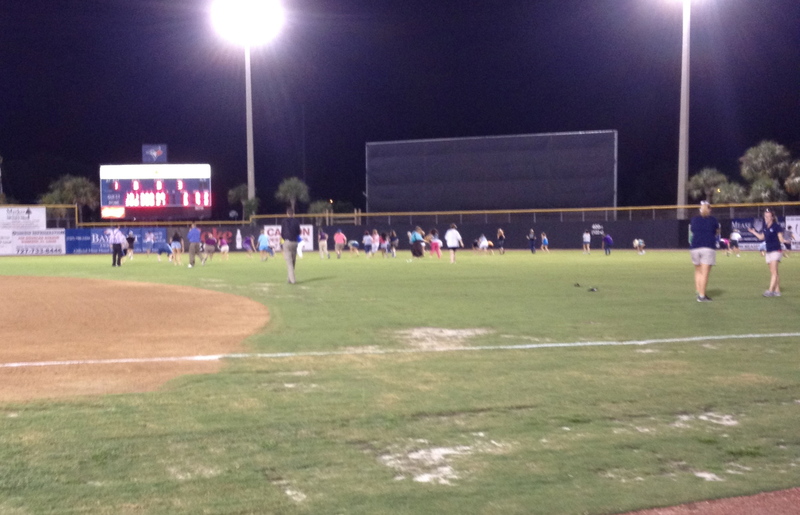 Ladies dash for diamonds…notice the 2 ladies in the middle, one in yellow and one in purple who fell! At least 2 ladies wiped out soon after starting the dash. Scrambling to grab jewelry boxes, would I get one? More importantly, would I survive? While they allotted 3 minutes to grab the boxes the whole thing was over in about 30 seconds! I was proud of myself, not only did I not fall, I managed to grab six boxes. Sadly, I didn’t win one of their prizes, however, I got to go home with the best prize of all…Baseball Ross!!!! While I didn’t win, I did have a blast! It really was fun, the ladies that participated in the dash really seemed to have fun with it and we all had a laugh. I think I’m going to like my new home town.